Please Join Us JUNE 5th for a Special Dinner! To celebrate the ROTARY FELLOWSHIP MONTH OF JUNE: Club President Diane Hill and the members of the Rotary Club of Falls Church cordially invite you and your friends to a Rotary Global Networking Evening: Thursday, June 5, 2014 6:15 p.m. (cash bar opens 5.30) Harvest Moon 7260 Arlington Blvd Falls Church, VA 22042 A Special Chinese Fellowship Dinner and Silent Auction Speaker: PAG Bilal Raschid on "Rotary Global History Fellowship" $ 22 cash or check pp. Cash bar. Pls RSVP by 5/29 or asap to PDG Tin Tin Raschid at tintinraschid@gmail.com or 301-469-7592. Special menu: Crab meat & asparagus soup, Salted Crispy Shrimp, Cantonese Roast Chicken, Black Pepper steak, Mix vegetable and tofu, Hunan crispy fish fillet, Yang Chow Fried Rice, Fresh orange platter. We hope to see you for fellowship and networking! 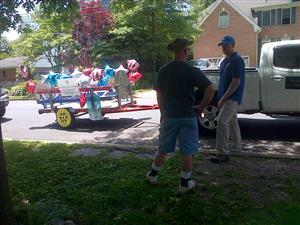 Thanks to everyone who came out to our club's annual Beverage sale fundraiser along the parade route on Memorial Day! We enjoyed serving you ice cold draftr beer, sodas, and water for a good cause! And visiting with community members to share our club's service projects, scholarships, and "Service Above Self." a special thanks to pP Doug Dreyer, Rotarian Erica Brouillette and fiance Kevin for organizing and decorating a Rotary Float to be in the parade this year! More photos soon.